Here we have a good old fashioned protest. This is all about truth, justice, the American way and saving technogeeks everywhere money on their downloads. Well at least for this girl here. 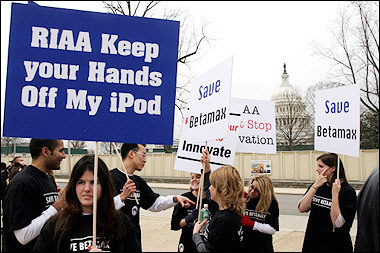 Notice two other young ladies protesting to save Betamax. That's right Betamax. Who would have thought that a video format only 37 people admit to owning, there could be thousands of undocumented cases, would be worth a protest in favor of it? Okay now let's look at the subjects in our picture here, we've got this girl in the front, who doesn't want people touching her iPod. I guess that shuts the door on casual petting. Now in the back we've got Harold & Kumar flirting with these four girls who seem more interested in the permutations Harold is dropping than fighting for the issues of the day. This is America's youth, rather than fighting for the important issues of the day, they decide to bundle a group of lesser issues together. This clearly allows the opportunity for otherwise uninteresting people to get together and have a lesser discussion, likely on how they're going to flout the government and download a sweet peer to peer filesharing bot. Shine on you crazy diamonds!